Despite the ongoing bear market, Huobi’s crypto asset trading service, Huobi Derivative Market (Huobi DM), recently saw its trading volume soar past USD $20 billion. The milestone came a mere 15 days after Huobi DM racked up its first USD $10 billion in trading volume in its first full month of operation. Based on the Huobi DM team’s internal customer research, many users are particularly drawn to the fact that the platform’s robust design and features have resulted in zero clawbacks so far. “We’re pleased with the strong response. This reinforces our belief that Huobi DM truly caters to our user’s needs. We’ve been getting positive feedback from our clients on our lack of clawbacks as well as Huobi DM’s capacity to help sophisticated traders manage the risk of spot market fluctuations. I believe this explains our platform’s explosive growth, even in the midst of the ongoing bear market,” said Livio Weng, CEO of Huobi Global. 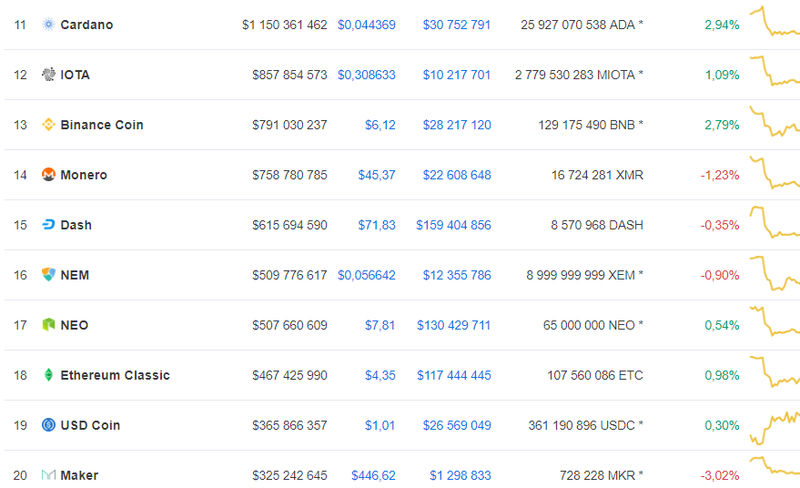 As of now, the top-10 coins are in deep red, as per Coinmarketcap. The only gainers at the moment are XRP (+0.62 percent), EOS (+0.11 percent) and Bitcoin Cash SV (+0.46 percent). Even the recent winning horse Tron (TRX) is trading in the red zone, showing a drop by 1.46 percent. Things look better on the top-20 list, with many more winners today. The top gainer among the top-20 coins today is Cardano(ADA), showing a rise by 2.94 percent. It is closely followed by Binance Coin (BNB) with its 2.79-percent spike. The third top gainer here is IOTA, going up by 1.09 percent. NEO, Ethereum Classic and USD Coin (#17, #18 and #19) are also rising but very poorly, compared to its aforementioned peers. WAX, Stratis, and Aeternity are the only crypto assets that have shown an over 20-percent increase on the top-100 crypto scale. A coin which seems to have a large potential for growth outside of the top-100 at the moment is Everus. Over the last 24 hours, it has spiked 22.28 percent and seems to be rushing on. Everus is a Malaysia-based crypto startup that aims to offer blockchain as a service on a global scale. Presently, the company is busy conquering the South Korean market, which is the third most active one in the world. EVR is the native coin of Everus, based on the ERC20 standard of Ethereum. As per Coinmarketcap, the coin is so far available on two crypto exchanges – C-CEX and Cryptopia. The latter suffered a major hack the other day, now going offline until the matter is solved. However, as U.Today reported earlier, the crypto community suspects an exit scam in this case. Currently, EVR has a 456 329 484 EVR token supply. Its market cap value totals $5 646 049, which gives the coin position #335 on Coinmarketcap. The price of EVR is trading at $0.0123 at press time.